Falafel are perfect for al fresco eating – picnics, barbecues – as well as lunch on the move. 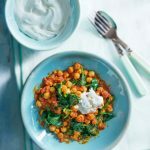 Chickpeas are packed with protein, fibre, iron, manganese and magnesium. They also contain fructo-oligosaccharides, which increase the friendly bacteria of the gut that improve digestion. These falafel are baked instead of fried, so they don’t absorb extra oil. Pre-heat the oven to 200 C/ 400 F/ Gas mark 6. Lightly oil a baking sheet. Put the chickpeas in a blender or food processor and process for a few seconds. Add the onion, coriander, mint or parsley, garlic, spices, gram flour paste and olive oil. Process for a few seconds until combined and a fairly smooth, stiff puree.